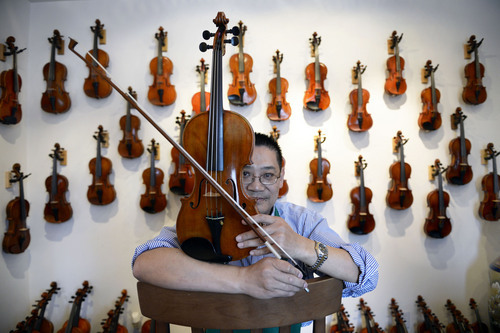 ﻿﻿Charles Wei Liu has spent his entire professional life in pursuit of the technical and artistic perfection of the violin. Charles W. Liu's exquisite string instruments represent the cutting edge of high quality, hand-made instruments for all levels.﻿ This year's collection includes a 1904 Bisiach, an 1845 Pacherele, and many others. Our inventory of bows includes makers like W.E. Hill & Sons, Morizot, Nurnberger, and Pfretzner. Committed to carrying only the best quality instruments of every price range, Charles W. Liu Fine Violins was founded for the purpose of making even the most high end instruments financially feasible for musicians. For our student players we carry the Suzuki Book series, in our sheet music inventory, as well as all major concertos, etude books, and scale books.